Well, nobody seems impressed that she allegedly copied Princess Anne. I would be horrified in PA´s position to think that apology for a female might be copying me. Another major pr fail. Anne looks regal and has some presence, council cath is just that, a sink estate push through with no class and no presence at all. Maybe she should copy PA´s work ethic. Juggers lovie, stop being so desperate, you really are making a comple 100% fool of yourself now. If that is all you can dredge up then maybe it is time to throw in the towel and find another job, because you sure aren´t making a very good one here - unless that is your aim, to show her up for the fake, unpleasant, common person that she is - if that is the case then you are doing your job well, because the public do not like her, or her common sink estate family, and the sooner they get rid of her the better. Can just see all the street parties, celebrating have to support this trailer trash and her fake family. Kensington Palace PR in overdrive when your trying to compare unpopular Royals with HM one week, and another one of our hardest working Royals, Princess Anne. Kate's PR out in full force. Desperately trying to make her look hardworking and likeable. That ships sailed. When you have somebody laughing their head off at remembrance, refusing to hand out shamrocks, telling the press she would be cutting back royal duties after 3 years of being in the RF....well the damage has been done. Pity she doesn't copy Anne's work ethic. I can't believe this has been published. It's really, really rubbish. ^ As you said, it's the way she carries herself; but what also immediately sprung to mind is her hair... Even when up, it's always a sloppy job. She always has a hairnet - a sure sign that the person who did the hair doesn't know how to properly do it. And neither does Kate change hairdresser, nor does her hairdresser train to improve up-do skills and tiara hair. No one in that household seems to have even the tiniest bit of drive for improvement. No one, neither staff nor bosses. And now that she's cut it, she still has loads of fake hair in (likely extensions or a weave) and her up-dos still remain in "low bun" territory, as the weave/ extensions don't allow for a high up-do, which would have looked smashing with any tiara. Other women use fake hair too, but it's usually one or so strand to clip in or braid in, which does not damage the hair and is for just that hairstyle: to plump up an up-do for example. At the end of the day, when you take off your make up you also remove those strands. Kate should use that. The cut is good now, but she needs to learn better styling and it would look better w/o all that fake hair, it's still in "mop" or "cocker spaniel" territory. I think Kate isn't allowed a high priced hairdresser anymore; no more best of the best, she is clearly getting third tier or she's basically been told to do her own hair and this is another sign of disfavor. No more Richard Ward or anyone who could do this without a net. She's clearly someone who isn't getting the best anymore. It was only a matter of time and frankly I am certain that she won't get expensive stylists. I wonder if Charles has cut back on her weekly treatments and told her she will be doing without since he's not paying her style herself for her own pleasure only. Council Cath must have really ticked Charles off. He's all about the big payback. I am looking forward to the day. I am certain that the lack of couture was a sign, but now she lacks pampering at a stylist's studio. Just another sign of disfavor and I am certain that she won't really get it back. Charles must fantasize about the push-back he's going to dole out. THE DUCHESS of Cambridge has come up with a very personal way to support a child cancer charity – by donating her hair to make wigs for young patients. When her hairdresser Joey Wheeler cut off seven inches from her usual length, Kate asked an aide to collect the locks and send them to a charity, thought to be the Little Princess Trust. The Herefordshire-based organisation has realistic wigs made for children who have lost their own hair through chemotherapy or radiotherapy treatment. The idea came to Kate as her hair was cut at Kensington Palace by Joey, 30, who works for Richard Ward Hair in Chelsea. A royal source said: “Four months ago Joey persuaded her it was time to take off some of her hair; he said it was just getting too long. “While Joey was snipping away the idea came to her of doing some good with it rather than throwing it away. Nice thought, but she has obviously colored her hair in the past, so that hair is useless for making a wig as is about 85% of donated hair. In the states hairdressers donate their fee for the haircut, but the hair is mostly discarded. In order to be used for wigs, hair must be "virgin" - it cannot have been colored or permed at any time. Consequently, the only virgin hair that is collected is from children. Firstly, I find that creepy actually, Diana donated/ auctioned off her dresses, this one gives her hair! Secondly, only "virgin" hair (i.e. untreated, natural hair) is used for making wigs, and we all know K colours hers and possibly has also keratin treatments/ Brazilian blow drys. Thirdly, no way did she cut off 7 inches last summer, her hair was cut off and become quite longer and then shorter and shorter, but I highly doubt it was 7 inches. Also why keep this info for so long? The only thing Kate could donate in terms of hair are her extensions and wiglets. Kate could donate her hair, but they'd throw it into the garbage like they do with a lot of their donations that they cannot use. Nothing wrong with coloring or treating one's hair, especially at 36. Lots of people in their thirties have gray hairs, some of my friends went gray in their twenties. In addition to the color, Kate's hair is naturally curly, I would not be surprised of she treated it to keep it straighter and therefore easier to manage. This story is clearly BS. So, here are the official rules. Good on Kate that she donated whole 7 inches (even though she sure as hell hadn't had 7, but less, cut off), and did so in spite of chemical treatments! What a hero! 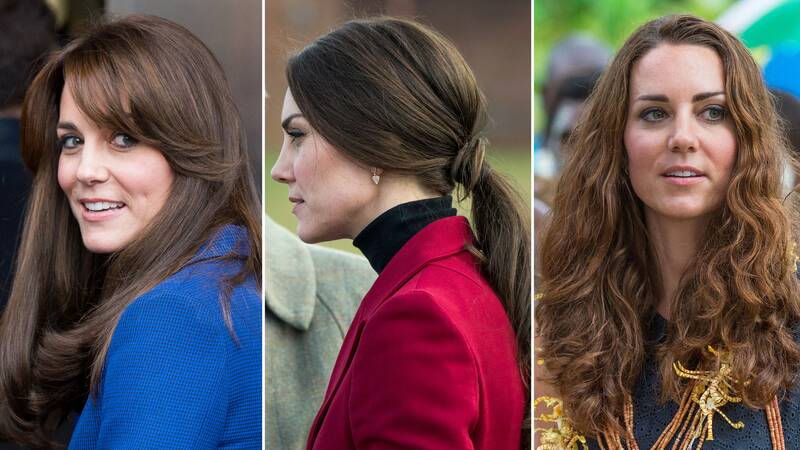 "The charity was informed that the Duchess of Cambridge’s hair was donated anonymously. It would have gone through the charity’s processes, just like everyone’s kind hair donation. The wig manufacturers are the skilled specialists who blend the hair donations together, as it can take between 7-10 individual donations to make a single wig." Why the heck did Waity (or her staff) call up the charity to inform them that Waity donated (bah! humbug!) her hair anonymously?? Makes no effing sense. This is quite clearly a PR bs thing. The charity can't check for veracity anyway, and on top of that 7-10 individual donations are needed for one single wig. I should call them and tell them I donated too! What's with the "Kate's fab hair" campaign?? Firstly, no one needs that many brushes for one styling, secondly, why don't they show her extensions and wiglets? We've seen evidence of her wearing both since the wedding, why is that buried? Both Meg's and Kate's hair is treated to death and in great parts fake, why pretend otherwise? If they want fabulous hair, they should show pics of Victoria and Madeleine of Sweden, Letizia of Spain, and Maxima of the Netherlands. Don't think these ladies wear fake hair, not that I have noticed. E.g. Madde's hair hasn't changed one bit since she was a teen, as opposed to what we have seen of Kate's hair, which miraculously grew thicker once she got the ring.